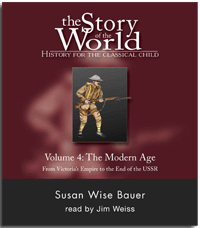 This spirited reading of the final volume in Susan Wise Bauer’s The Story of the World history series brings to life the stories and records of the peoples of the modern age (1850-2000). Introduce your whole family to this engaging history series–over 800,000 in print! Now more than ever, other countries and customs affect our everyday lives-and our children need to learn about the people who live all around the globe. Susan Wise Bauer has provided a captivating guide to the history of the modern world. Written in an engaging, straightforward manner, The Story of the World Vol. 4: The Modern Age, Text weaves world history into a storybook format. This volume covers the major historical events of the years 1850 to the late 1990s, from the reign of England’s Queen Victoria to the collapse of the Berlin Wall. This Audiobook is available as downloadable Mp3s or as a Multi-Disc (CD) Set. Don’t forget that we also have an Activity Guide which turns Volume 4 into a full one-year history, geography, and literature program! I can’t believe that I found this product for the price. You guys are amazing! Thanks for helping us educate ourselves and our kids. We love this series! I bought the series for my son as an audio listen for fun. Since he loves history; and is visually impaired, listening to the series fills in the gaps in his knowledge of certain history time frames. I started listening, and was drawn in, so I started listening in the car. Then my husband was hooked! I now use the curriculum for my daughter’s history class. She doesn’t hate history anymore. These are read (and written) in an enjoyable way. Why didn’t they have these books when I was in school?